That’s what they told me to write! Why not just have someone walk around with a sign “gas truck filled with diesel”? Thank goodness, I only speak Engrish! No problem, I usually smoke in French. CAPTION IS MADE AT HERE! (PLEASE LEAVE A CAPTION FOR THE ENGRISH PHOTO; ALL VULGAR ENTRIES, SPAM, ETC. WILL BE DELETED. LET’S BE CREATIVE!) in engrish. You’re welcome! We hope you spell Arbic! It reminds me of one of the closing scenes of Tiny Toon Adventures. Yeah I know, I’m revealing my age. @Pectolatra: I think they stole that idea from George Burns and gracie Allen. Oh, gods! How old am I? So THAT’S how you haul 36,000 its! My car gets 30 miles per It. Where’s the truck hauling 36,000 Shes? 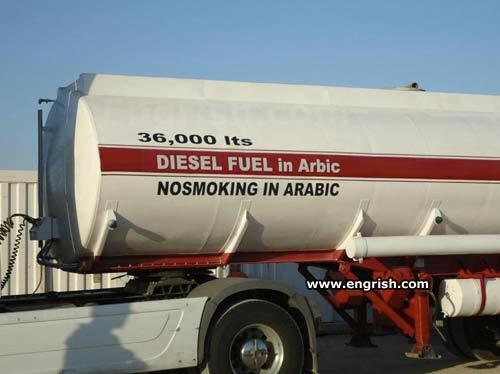 Hey, I told you 36,000 lts in Arabic too! Arbic is the language spoken at Arby’s, right? So, what’s it say on the other side of the truck? Is that where the Arabic is? lts lts lts lts lts….5 down, 35995 to go, lts lts lts ……hold it, Its time to pray! Diesel fuel in arbiculated vehicle. Instead of Arabic, they got Arial. So where on earth is Arbia? In Labia Minor I guess. What, my cigarette? No it’s fine, I’m smoking in English! Arbic is the official language of Arby’s restaurants. @Chris – before Rowan and Martin, and long before Tiny Toons, there was George Burns and Gracie Allen, “Say goodnight, Gracie”. “Goodnight Gracie”. Both Laugh-In and Tiny Toons were referring to this classic tag line. Can I light a match in English then? I am not in the office right now. Please email any work to be translated. Das cool, I smoke English!